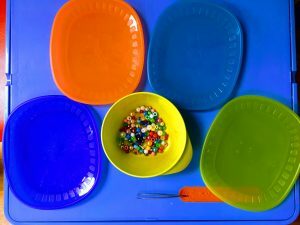 We had fun sorting beads onto plates using tweezers! My 4yo gets upset when we are at home and my 2yo needs a nap – he loses his play mate! So that’s a key time for me to think of activities that will keep him happy whilst my little one sleeps. It’s also a useful time for me to get a few household chores done, so as well as things we can do together, I like to think of things that I can encourage him to do without needing active participation from me. 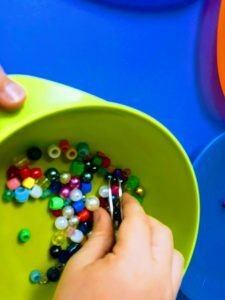 For this activity, I put a mixed bag of beads into a bowl and set out 4 plates. 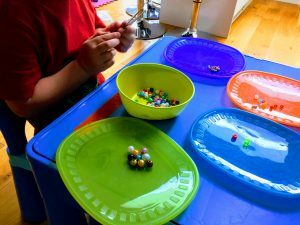 I then asked him to transfer the beads onto the plates using the tweezers, and to sort them as he did into different shapes and sizes (I thought we’d be there all day with colours!). 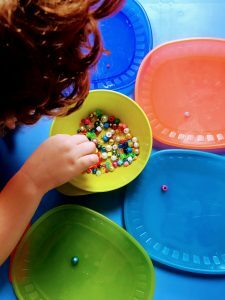 He loved this, and it was improving his fine motor skills to boot. He was pretty meticulous for about 2/3 of the bowl, and then he did resort to his hands. But to be fair, that was about 20 minutes in, so not a bad go! Next story Testing out friction with duck races! 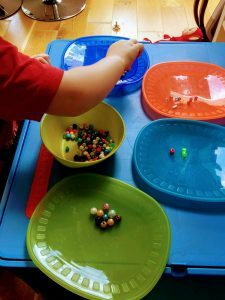 Previous story Oobleck – fun with slime!